The first in the four-part series of picture-books exploring the experiences of the modern children. The subject matter is factual, but the inventive trio of Veera, Tatu and Patu give the realism a wild and hilarious edge. 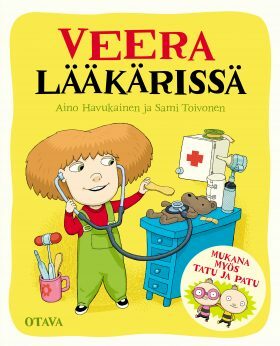 Veera is going to see the doctor for a routine check-up and that mishievous pair of rascals Tatu and Patu insist on comíng along. When the time comes, however, the boys begin to get a bit excited and nervous about it all. Just to be on the safe side, they but on several extra layers on clothing in case the doctor decides to examine them, too. The doctor tests Veera’s sight and hearing, measures her and weighs her, listens to her heart and breathing, and of course, rounds things off with a vaccination or two. Veera comes through the experience with flying colours, but what of Tatu and Patu?